Within your own heart is a limitless source of supreme energy – the energy of love. No other force in the universe compares to it. The world's great spiritual traditions, both past and present, agree on this simple principle. Can love be harnessed and applied to others used as atool for changing lives? Lovingkindness Meditation teaches a traditional practice for cultivating love, and applying it as a life-changing force. Learn to trust in your own loving, intelligent heart. Sharon Salzberg has studied and practiced meditation with Burmese,Indian,and Tibetan teachers for the past 25 years. She is a cofounder of the Barre Center for Buddhist Studies and the Insight Meditation Society,where she lives and teaches. Sharon Salzberg directs meditation retreats throughout the United States and abroad. 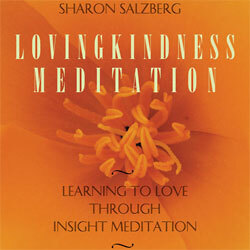 She is the author of Lovingkindness and (on audio) Lovingkindness Meditation.